Students studying in the library at Hesston College, 1950. Also shown in comparison to a photo of the first library at the College, likely early 1900s. 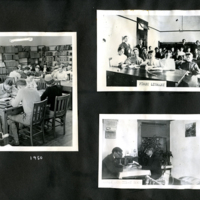 Beyler, Clayton, “Students in the Hesston College library, 1950,” Hesston Public Library, accessed April 19, 2019, https://hesston.digitalsckls.info/item/1644. 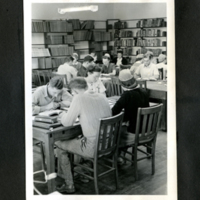 Photograph taken by Clayton Beyler showing students studying in the library at Hesston College in 1950. Also shown in comparison to the first College library in the early 1900s.